We can replace your entire top and bottom set of teeth with just 4 implants per arch — in one visit! As of 2018, studies confirm that nearly 40 million Americans are missing all of their teeth. The factors that contribute to missing teeth typically vary from person to person. Some of these factors may include dental decay, smoking, gum disease, poor oral hygiene, Periodontal Disease, and bone trauma. From mild cases to severe cases, tooth loss disrupts daily functions and interferes with everyday life. In addition, tooth loss worsens with age. When someone is presented with tooth loss, they are dealt with a plethora of issues. Pain, migraines, eating trouble, and low self-esteem may arise as a result of tooth loss. In severe cases, bone loss and facial disfiguration can and will occur. At TeethNow, we provide our patients with full-proof solutions to their tooth loss, as well as solutions to their discomfort, low self-esteem, and oral health decline. Our team of dental implant professionals perform specialized dental implant procedures, day-in and day-out, that each serve to fully and permanently restore patients’ teeth. In doing so, we restore our patients’ confidence, and more importantly, their oral health. Would you believe us if we told you that we can replace your entire top and bottom set of teeth with just four implants per each arch? Moreover, what if we told you we can do that in just one visit? It’s true. The All-On-Four procedure does just that. The preparation for this procedure utilizes our highly innovative, in-office technology to gain all the information and measurements necessary for the most successful results. Once we deem the patient qualified for an All-On-Four, we take x-rays, a CT Scan, and impressions to create custom engineered teeth for them specifically. Patients can receive All-On-Four on both their top and bottom arch, or on just one of the two. 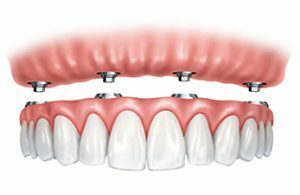 The fixed bridges that we custom engineer to your mouth attach to the four implants on the top jaw and the four implants on the bottom jaw. You will leave our office with permanent sets of teeth that both look and function like natural teeth. We offer two different types of implant materials for our All-On-Four patients to choose from. They can receive titanium implants or ceramic implants, depending on their preference. Ceramic implants are the most natural and holistic means to a new smile. Metal-free, ceramic implants are bio-compatible, extremely safe for the body, and more. In addition to gaining a beautiful new smile in just one visit, your All-On-Four acts as a stimulant for your bone. Your brand new smile will restore your health, confidence, and ability to enjoy the things you have been missing. Don’t let tooth loss control your life. Call TeethNow at (212)843-4444 for the smile you’ve been missing!